B.L. Acoustics have successfully completed the replacement of the Public Address and Voice Alarm System at the Queens Tennis Club, West London. 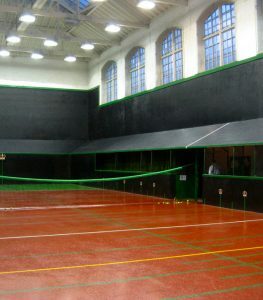 The Queens Club was established in 1886, and was the first multipurpose sports venue to be built, anywhere in the world. The club is a world class sporting facility and facilitates a wide array of racket sports. The Club also offers excellent entertaining and dining facilities, making it one of the most coveted memberships in the country. Each year the club hosts the world famous Aegon Championships, the World Rackets Championships and leading Real Tennis and squash events. B.L.Acoustics have been maintaining the PAVA system at the club for many years, keeping their ageing system functioning fully. However, the system was due for replacement and BLA were chosen to carry out the important upgrades. The old Baldwin Boxall system was replaced with an EN54 compliant Bosch PAVIRO system. The PAVIRO is the newest addition to the Bosch range of PAVA products and provides a good cost-effective solution. The existing system was relatively simple, consisting of 14 zones and a single firemans microphone, paging microphone and emergency messages. The existing firemans microphone was an all-call unit which was built into a larger fire alarm panel. As part of the upgrades the microphone was upgraded to a higher spec unit offering zoned announcements. The microphone panel still had to fit within the space provided by the existing microphone, so a custom panel was built using the PAVIRO call station kit. As the club is constantly in use, the system had to be changed over within a single night shift. To ensure the change over ran smoothly there was a substantial amount of planning and engineering that occurred prior to the replacement. Changing from Baldwin Boxall to Bosch meant that new End Of Line devices had to be installed to each circuit. The new EOLs were mounted to faceplates that matched the existing units to ease the replacement. The fire alarm interfacing was also changed to comply with the latest standards. The previous system had momentary actions for the evacuation and alert messaging, meaning that if the link between the fire alarm and the voice alarm perished during a fire the evacuation message would stop. This was upgraded so that the message broadcasts would latch once triggered and would only stop once a reset/silence signal is received from the fire alarm. Effective prior planning and management of the project ensured that the changeover of the system was successful and had zero impact on the day-to-day operation of the club.